Autumn seems inevitably to bring a turn back to the local. Hill climbs somehow fit this return – this digging into our back-yards. The hill climb demands engagement with the ground – even as you pull up on the bars, it seems to be pulling you towards it; your focus becomes literally grounded as, eyes to the tarmac, you grunt your way slowly up, the world cut down to rasping breath and burning legs. Hill climbs come as summer turns to autumn, and they mark the end of the road cycling calendar. If the world has opened out over the long, light, warmer months, it begins slowly now to close back down again. The grip of familiar territory upon our riding might have loosened during summer, but it’s re-established now. I enjoy this cosy sense of coming back, of coming home, to the local; the time between now and Christmas is about ‘getting in the miles’ on favourite roads between favourite places. For me hill climbs embody this return to the local; the hard pull up a short, steep incline my last grunt before, with winter in sight, I drop into gentler riding. 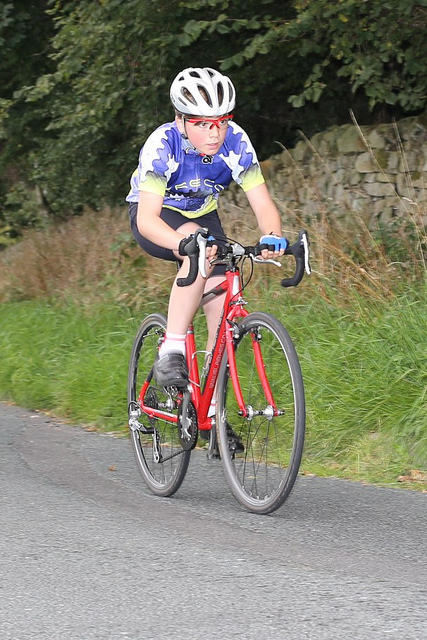 This year something about uphill racing appealed to my son Bobby, who now he’s 12 can compete on the road. 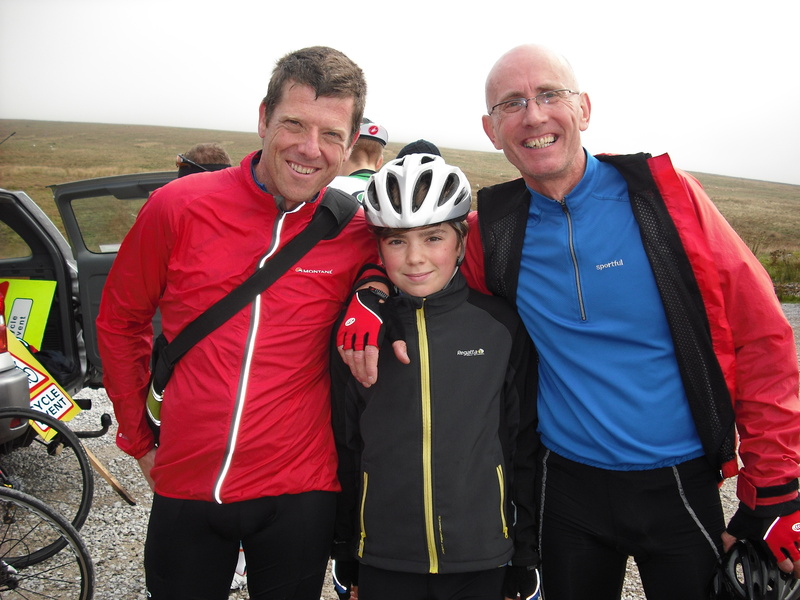 His Uncle Derek was also enthusiastic, so the three of us rode Lancaster Cycling Club’s hill climbs on consecutive Thursday evenings. The first, Condor Bottoms, climbs the Quernmore Valley’s short and steep west side. The second, Jubilee Towers, goes the other, longer way out the valley – up onto the Forest of Bowland. Bobby and Derek enjoyed these events so much, they wanted more. 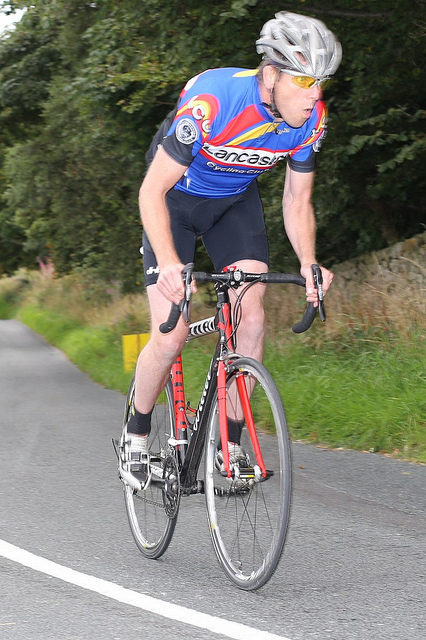 So the next week we all had another go up Jubilee Towers in Lancaster CC’s Open Hill Climb. This event attracted three current National Hill Climb Champions – Eve Dixon, Lynn Hamel and Jack Pullar. They’re considerably quicker than us, but however fast or slow you are, there’s something universal in the hill climbing experience. For the Jubilee Towers climb, you start on a gradient so steep a concrete block is placed behind your rear wheel to stop you slipping back. Up until then, you’re in the world – getting ready, making small talk, warming up. But as your start time draws closer you become more serious, quieter, less outgoing. When your number’s called, you line up, and – as the final seconds are counted down – you compose your breathing. Then away, you move into the climb, and enter a different world. Racing uphill quickly extinguishes all thought beyond the most basic instructions to yourself (‘out the saddle’, ‘up a gear’). The world closes down around your body, bike and breath; everything else is gone. This reduction to body, bike and breath is brutal and beautiful. To race uphill is very hard, but freedom comes from mind being put in place by body. Within minutes the effort is done, and you re-emerge into a world you’ve barely left behind. It’s the same world, but you’re a bit different now. Physical recovery from so short a burst is rapid but at another level something’s changed, though exactly what I struggle to say. For me at least I think there’s a small sense of empowerment – it’s hard not to be just a little bit impressed with yourself after making such an effort. But also, a transaction has taken place: your emotional energies have been invested in the hill; the hill now matters more, both to you and also I think – because hill climbs are not merely personal experiences but also more importantly cultural events – to cycling. Many thanks to Graham Atkinson for his permission to publish some of the super photos he took on Condor Bottoms in September, and also to Bobby’s Uncle Derek, for his of the three of us after the Jubilee Towers climb. This entry was posted on October 1, 2013 at 1:54 pm and is filed under CYCLING EXPERIENCES. You can follow any responses to this entry through the RSS 2.0 feed. You can leave a response, or trackback from your own site. Great stuff. 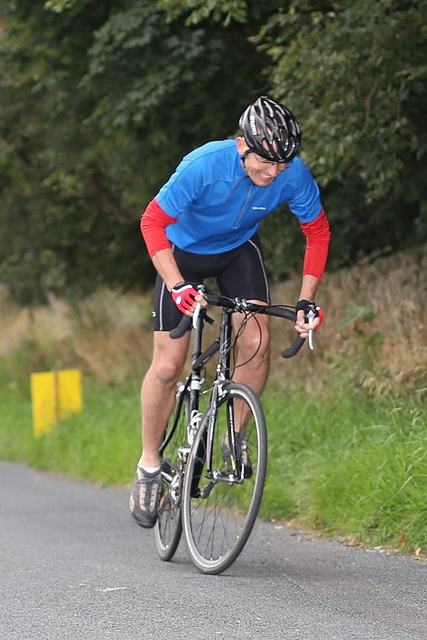 Jubilee Towers is a classic – it’s great to have a local climb which has a bit of cycling history about it. It’s a classic case of ‘it never gets easier, you just get faster’, and i love to use this climb to test where my fitness is up to. Great pay-off with the view at the Tower, and if you’re in the mood for more, just crack on through the trough of Bowland – great roads, what more could a man want? Ha, yes! We could call it ‘The Campaign for Real Air’?! I’ve always loved uphills. I still ride as hard as I can in an uphill, holding that sixty year old heart to a rate of 160 and occasionally bursts of 170 on the four mile climbs around Los Alamos. It does put you in an ethereal world where one is balancing on the thin edge of oxygen debt vs. exhilaration. Uphills also let the cyclist go all out without much danger, other than the danger of cardiac arrest in my case. Speeds are low and one has gravity working with the brakes rather than in opposition. I got into a big argument with someone called Principled Pragmatist about Strava. My main beef with online competitions is that one has to balance one’s need to compete with the fact that one is doing so in an uncontrolled environment on public roads. Dave, I’m wondering what you think on this topic. My two cents (more like a tome) is on my own site. Thanks very much Khal, and for the link to your piece on Strava. I haven’t thought much about it, but I think I agree with you, on the whole (though I think you and ‘Principled Pragmatist’ (PP) probably agree much more than either of you can see – it’s a bit like the broader argument about ‘responsible cycling’, isn’t it? The vast majority of people cycle sensibly, as I’m sure do the vast majority of Strava users; though what ‘PP’ seems to be missing – and what I think is your key point – is the consequences (potentially unintended) always residing within new technologies, and there I think you’re absolutely right to raise the possibility (which is being discussed over here in the UK, too) that Strava might tend to encourage recklessness – I think that’s a strong hypothesis. Sociologists of science and technology (amongst others) know a lot about this – we never just incorporate new technologies into our existing practices; those practices are re-made through those technologies; so I’d say it’s rather naive to believe ‘Strava cycling’ is the same as ‘non-Strava cycling’). And yes, I have every right to ride on the road, and to ride fast on the road, but self-preservation if nothing else tells me not to push the limits. You only have to look at the pro-peloton to see what happens when even *the best bike riders in the world* push the limits – did you see the Men’s World Road Race at the weekend? – a ridiculous number of crashes; but of course they’re on closed-roads. I’d best stop there, but it feels like there’s quite a bit more to think/say about all this. Thanks for bringing it up! And of course, feel free to continue the conversation, if it feels useful. There was a time, when I was a licensed racer (and even before that) where I kept a log of miles per week and of times on my favorite rides. In Hawaii, I kept a running log of my personal best climbing Tantalus Road, which was a hairpin-laced 4 mile climb with an elevation gain of about 1900 feet, as well as the site of the annual Tantalus Time Trial. I think my best climb was about 23 minutes. The best riders did it in under 20, and one of those best riders was on my own team. So I am familiar with logging miles, logging PB’s, and competing with others. We never raced each other *down* that hill and in fact, I don’t recall any descent time trials–modern mountain bike downhilling was not invented yet, to my knowledge. Racing for top time on a steep descent was considered silly and on more than one occasions, since the top of Tantalus was in a rain forest, people would wipe out on the way down even when riding in a controlled fashion. Those were real rides with real colleagues, not to mention, real people who would yell at you if you rode stupid. My concern, as you say, with this new technology is it pushes all the competitive buttons and none of the self-restraint ones that might be present on a real ride. I’d hate to be the guy trying to beat Kim Flint on that descent in California. One would have to beat him to the grave, I guess, to win the final race.